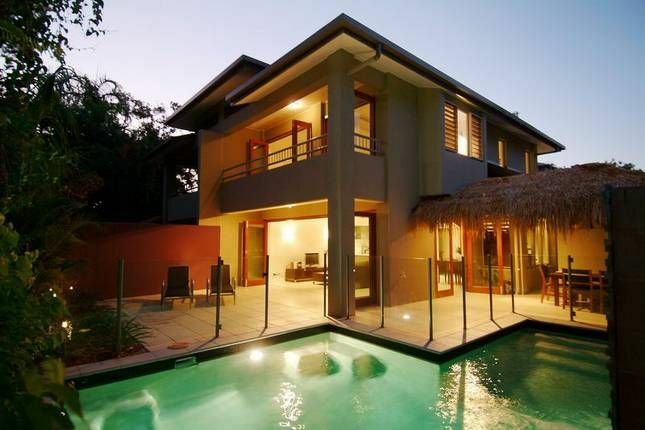 Lifestyle - Stunningly modern & spacious villa located just moments from famous Four Mile Beach. Spend your holiday relaxing by your private pool, cooking up local produce in the gourmet chef's kitchen or strolling Port Douglas village with its world renowned restaurants & boutique shopping. With three bedrooms & two bathrooms, this villa is perfect for families or couples holidaying together. Accommodation - Upstairs are three bedrooms; master with king bed & ensuite access to the central bathroom, second bedroom with queen bed & ensuite, third bedroom either two singles or a king. Downstairs the fully equipped gourmet kitchen has all the modern conveniences for a relaxing holiday (including dishwasher, coffee machine, blender & juicer) & opens onto the spacious dining & living areas with l-shaped lounge & entertainment area (flat screen TV, DVD/CD player). Bi fold doors surround the living areas, giving access to the outdoor covered dining area, gas barbecue, courtyard with sun lounges & hammock, private pool with water feature & tropical gardens. Features - Located just a minute from the golden sands of Four Mile Beach & a park with children's playground, this villa was designed & furnished with luxury holiday accommodation in mind. Air conditioning & ceiling fans throughout, carport, downstairs powder room, laundry. Great space for family holiday. We enjoyed our stay even though we were house bound due to weather. Beach was a couple of minutes walk which was nice and easy. My only suggestion is take your own pillows as they weren’t comfortable at all. I would recommend this property to families as it had everything you needed. Glad to hear you had a great stay, despite the weather! Thanks for your feedback re the pillows, I'll check those out & replace any that are necessary. Great property, well designed unit. Very cosy and plenty of space for our group of 5. Felt very homely and comfortable with modern furnishings. Only downside it needs, not much but a little going over. The pool definitely needs a cover with leaves constantly falling from the trees and plants on southern end and the pavers would be more appealing if they were pressure cleaned. Otherwise very impressed overall, definitely will come back in the future. Glad to hear that you had a great stay! Thanks so much for your feedback on the villa. We've had an overhaul of the garden, removed the plants at the end that were dropping leaves & replaced with beautiful tropical foliage. We've also completed our annual high pressure clean of the courtyard since your stay. The property is very nice and clean, location near the beach and park is great and it's very private. Really good space downstairs and well equipped kitchen. Beds are comfy. We found it wasn't very family friendly though. The tiles outside next to the pool get extremely slippery when wet, which is just ridiculous! The stairs are a bit hectic for little ones and there's a glass covered dining table placed right under the stairs. One of our kids dropped a toy on the stairs and of course it hit the glass table which broke and we incurred an extra $460 fee, so it was quite unfortunate. We had an enjoyable stay. But to be honest the property needs to be given a thorough clean. Including a tidy up in the garden. Some of the mugs in the cupboard were still a bit dirty. Tiles missing from the pool. Need to put some of your well earnt money back into the property.A bit of pressure washing done around the property wouldnt hurt.For the cost of the accomadtion it should be better. I would give it a 7 out of 10 with a bit of love it could be a 9 out of 10. Future stayers have a right to know this. Photos dont always show these things. Great Location short stroll to beach,private pool is fantastic. Hi Neil So glad to hear you had a great time. I look forward to hearing from you next time you're heading to Far North Queensland! Regards, Simone. We had a fantastic stay! House was perfect, a short walk to the beach and very practical for our 3 year old. Ample pool and bath towels supplied, house clean and comfortable. Pool, hammock and banana lounges a delight! Hi Melinda Thanks so much for the great feedback! Glad to hear you had a great stay & I look forward to hearing from you next time you're heading this way! Regards, Simone.